A few days before Christmas 2006, having just arrived home in Atlanta for my break between college quarters, I was driving near the Georgia Dome when I spotted a new arrival in the neighborhood — an odd, trailer-like setup erected in a parking lot. Having grown up around the area, whatever it was seemed out of the ordinary, so I hit a U-turn and went to check it out. In that parking lot sat an “Authentic Louisiana-Style” restaurant operating almost as a food truck. About 15 months had passed since Hurricane Katrina, but this was my first real-life experience with what had previously just been data regarding the sheer amount of New Orleanians that had migrated to cities like Houston and Atlanta. I looked at the establishment and felt good. To know that someone could make a life in my city, especially after such a horrible disaster, was a beautiful thing. The following year, I remember watching the Saints-Falcons game on Monday Night Football in the Georgia Dome. Fully understanding that there was a sizable New Orleans population in the city that had no plans of going back home, I was curious to see how the Dome would look. The answer — very black-and-gold. It was nauseating. While I felt it bubbling in 2006, especially with our unfortunate “damned if you win, damned if you lose” opportunity to play the Saints in the first game back in the Superdome, it was at this point that I knew a real rivalry was no longer just brewing. And it wasn’t just each city busing fans to the other for games anymore. We were living in the same neighborhoods now. We were buying groceries and beers on Sunday mornings in the same stores, all while wearing our respective city’s jerseys. We were decorating our cubicles with Falcons apparel, only to have the next seat over donned with Saints paraphernalia. It was real, and for a city that at times was too apathetic to carry out its hate, it was amazing. 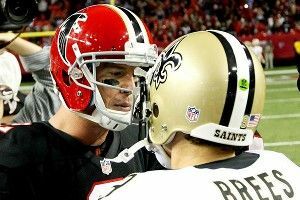 The rivalry between the Atlanta Falcons and the New Orleans Saints is intense for reasons outside the typical factors that constitute an NFL rivalry. Yes, they are in the same division, so they play each other twice a year. And yes, they are both in the same geographical region, so there’s a sense of Southern pride at stake. But those are arguably the two weakest reasons for the passion that currently fuels the rivalry. A shared region and a shared division have been constant since their first meeting in 1967 — 88 meetings ago — but for all intents and purposes, this rivalry, fueled by disgust for the other team (and, at times, the other city), is but seven years old. A brief look at each team’s respective history explains why. Historically, they are two below-average franchises. For as passionate as their fan bases currently are, neither has had a ton to cheer about for the majority of their franchise’s existence. Each team has appeared in just a single Super Bowl — with the Saints winning theirs in 2009, and the Falcons falling short in 1998. Division championships for the two franchises are few and far between (Falcons: 4; Saints: 5), with their trading back and forth only taking place in the past 10 years (’04: Falcons; ’06 and ’09: Saints; ’10: Falcons; ’11: Saints). Each franchise is eerily similar in its below-average ways. In addition to both having more to jeer than to cheer over the years, it’s worth noting that both franchises have performed at a near identical clip. Both have below-.500 records, with the Saints posting an all-time regular-season record of 304-393-5, while the Falcons are 310-400-6. Taking out the ties, that’s a winning percentage of 43.62 for the Saints and 43.66 for the Falcons. Yeah. In a rivalry with 88 meetings in 45 years, the Falcons have 47 wins to the Saints’ 41. Sure, each team has had streaks as the more dominant of the two (most recently, the Saints’ four-game streak, which ended last night), but as a whole, there’s no clear franchise that reigns supreme. Each plays in a state dominated by college football. Almost as a byproduct of being two historically subpar franchises, both teams have, until recently, been the second most-popular football act in their respective states. SEC football is not something to be taken lightly — ever — and the LSU and UGA football programs have long had a lock on the emotions of the football-loving constituencies in both Louisiana and Georgia. For many, Saturday, and not Sunday, was football day. While this is still true to some extent, with both professional teams becoming contenders around the same time, the rivalry has aided in Sunday catching up with Saturday. While I hate the fact that the Falcons’ one loss came against the Saints, for the rivalry’s sake I love it. Yes, I always want to beat them — badly — but that loss sheds light onto the reality that is the rivalry. When, like before last night’s game, Drew Brees pumps his team up with “THIS IS OUR DIVISION,” I love it, the same way I love the fact that Atlanta airport workers threw eggs at the Saints’ team bus. For two cities long apathetic about their professional franchises, this rivalry is an incredible thing for two cities that, by way of a disaster, will always be connected.